Written by Jordan Stokes and Matt Bombaugh. 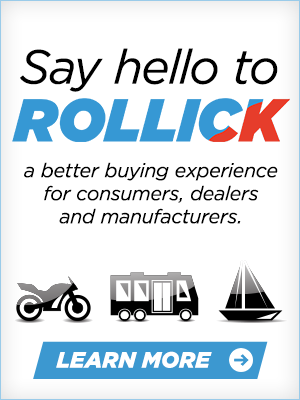 Looking to buy your first motorcycle? We’ve rounded up the 9 of the best beginner bikes for every type of rider, as well as 6 things to consider before you hit those want ads. As a motovlogger and general motorcycle enthusiast, I find myself giving advice about bikes to beginner riders at least once a day. Whenever asked, my first question to them is, why do you want to ride? For me, it was the escapism. The ability to get on a motorcycle and fully immerse yourself into the experience of riding as hit the open road with nothing but a full tank of gas is nothing short of a dream; the feeling of the temperature changing as you traverse mountainous paths, the smell of fresh cut grass as you rip through suburbia, and the true connection you feel to your surroundings. 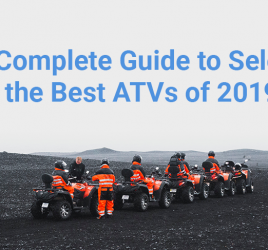 The motorcycle is the epitome of adventure, and with the these 9 best motorcycles for beginners, you’ll be out exploring in no time. Before you hit the road, be sure to cover all your bases and get great insurance to protect your beautiful bike. 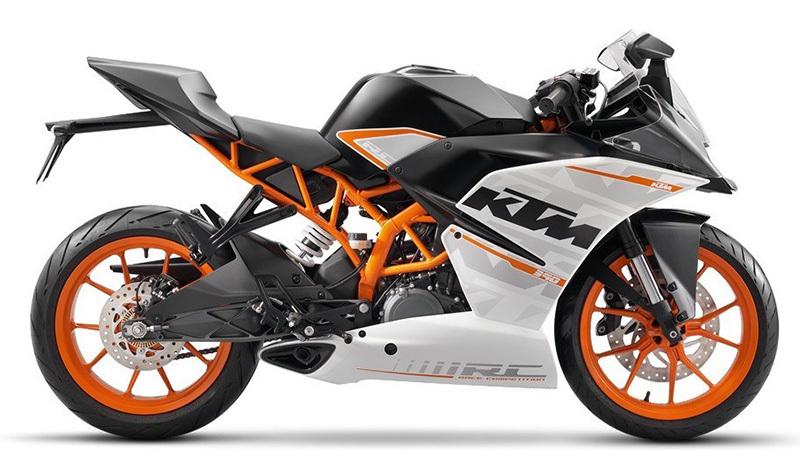 9 Best Motorcycles for Beginners: What to Consider? There’s a laundry list of things to consider when looking to purchase your first bike, and a fair amount of these items happen before you even get your first look. First and foremost, do you have a motorcycle license? Growing up in the suburbs of D.C. there was little chance of getting away with anything like riding without a license, but many of the people I’ve met on two wheels started their journey without the proper training or legal certifications. When I was ready to transition from dirt to street I looked no further than the Motorcycle Safety Foundation (MSF), which works with local community colleges and organizations to provide the fundamental knowledge of how to ride a motorcycle on the road. I’ve seen people with no prior riding experience enter the MSF course and on the third and final day have the proficient skills and knowledge to ride safely. After you’ve received your M classification on your license, it’s time to get serious about finding your first bike. Pro Tip: You should also think about frequency of use and what style of riding you plan to take part in. Choosing the beginner bike that fits these components best for you, will not only make your riding more enjoyable, but will keep you safer during the process. The best bike is the one that fits you best. Let’s break down some of the these factors. The biggest misconception when budgeting for a new motorcycle is how much you originally think you can afford. 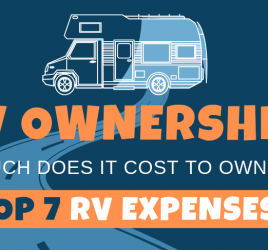 It’s important to take into account property taxes, insurance, new gear, and depending on your living situation, storage – essentially the total cost of motorcycle ownership. Insurance is one of the hottest topics among riders. Make sure to work with your current auto insurance provider first, as they will likely have a multi-vehicle policy that will reduce your rates. The pro to being a newer rider looking at lower displacement bikes is that the cost to insure is almost directly correlated to the amount of power a bike has, so prices should be on the lower end. Another tip is to look for motorcycle incentives, as many manufacturers offer savings to make the buying process more affordable. It’s also important to understand what motorcycle dealer fees you should expect to pay when going through the purchase process. Once you’ve been able to determine the true amount of money you can spend on a bike, it’s time to take that number to the want ads, dealerships, craigslist, Rollick, or even your local bike meets. Pro Tip: Knowing what you can afford to spend will help you narrow down your options in a big way. We recommend first time riders spend no more than $7,000 all in, on both their bike and expenses. Among the many heavily disputed topics in the motorcycle community, one that sits at the top of many riders lists is the acceptable power output a new rider should look to manage. 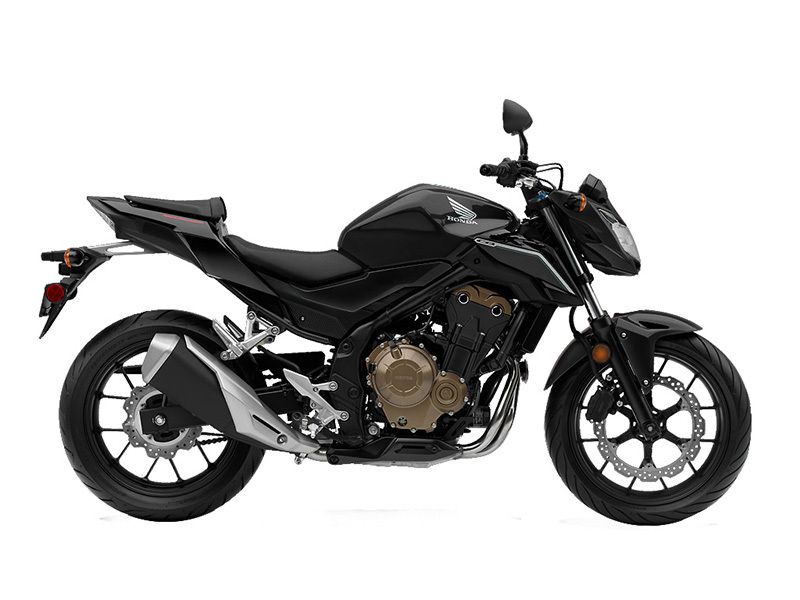 From 250cc singles to 1600cc V6 monsters, the motorcycle industry offers hundreds of bikes and engine configurations. For the first year of riding we suggest to stick with a bike that has no more than 600cc’s of power, which is being delivered via a smooth and controlled throttle response. Most entry-level motorcycles are far less twitchy in their throttle response, translating to a more dull reaction from the engine when the throttle is twisted. To some, this may sound negative, but in the first year of riding you’re still getting used to the incredible power-to-weight ratio that all bikes provide, so you’ll want a safety net in the event that you accidentally apply full throttle in a dangerous situation. 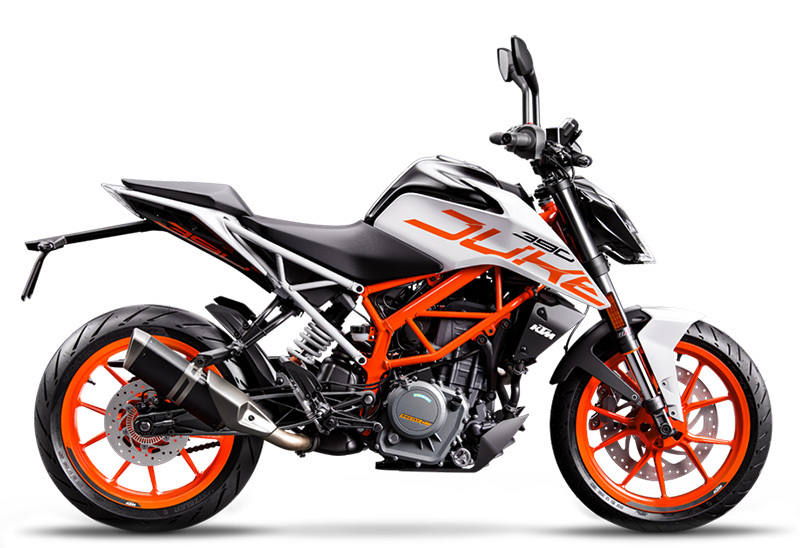 Our compiled list of 9 best motorcycles for beginners focuses on bikes in the sub 600cc power level that provide consistent throttle response through the rev range. The heavier the bike, the harder they fall. This stands to be very true as a beginner when you’re still building up your skill set and find yourself potentially making little mistakes. Make little mistakes on a heavy bike and it would be magnified into much larger and potentially dangerous issues. So go with what you can handle! Different styles of bikes tend to dictate the acceptable weight ranges of the bikes in their category. Choosing a bike that is relatively lightweight for it’s style will help you keep control in slow speed situations, allow you to feel comfortable with feet down, and generally give more detailed rider feel. As a first time buyer there are two general paths you can take when purchasing a motorcycle: new or used, with each having their own respective pro’s and con’s. The main factor: reliability. Luckily, as the motorcycle industry has grown, the reliability and accountability of large manufacturers has also grown. When purchasing new, most major manufacturers offer 1-3 year full warranties that provide a piece of mind, which is something that purchasing used can lack. If you’re purchasing used, do your homework on the brand, history of maintenance, and condition of existing parts to make sure you’re starting on the right foot. Purchasing a bike that is known for its reliability will keep you on the road and out of the shop. My second sportbike was a italian stallion Aprilia Tuono V4R. That bike spoke to me in ways that I can’t even begin to explain, but at the end of the day it wasn’t usable on a daily basis. The abismal 100ish mile range, the low and forward controls, and the overwhelming heat meant that it was more of a weekend warrior than the daily commuter that I was looking for. Things like storage capacity, range, comfort features, and wind protection can make or break your decision to go on that motocamping adventure or whether you want to ride to work. Being patient and dissecting all the features of a bike will ensure you get your money’s worth and increase your likelihood to ride. Using model specific forums, facebook groups, as well as online services like fuelly to determine various long term attributes to these bikes will help you decide what’s right for you. Riding a motorcycle is significantly more fatiguing than driving and the last thing you’ll want to feel at the halfway point is pain in your neck, shoulders, knees, or back. With the naked bike movement coming into full effect, and manufacturers pushing out amazing standard upright motorcycles with as much power as their supersport brethren, there is less of a reason to sacrifice comfort for capability. One of the main components to comfort is seat height. As a relatively short rider I initially found myself discouraged by the rather high seat heights that came standard on many of the bikes I was interested in. Over the years I’ve not only grown my skills to adapt to higher seat heights, but I’ve seen manufacturers work hard to make higher bikes more accessible for everyone (i.e. lower seats, lowered suspension from factory, lowering links available in the aftermarket). Pro Tip: Never buy a bike sight unseen and if possible, always take the potential purchase on a test ride in slow and high speed situations. If possible, use motorcycle rental services like Twisted Road to rent the bike you’re looking at purchasing for a couple of days. This will give you the chance to ride in the daily conditions you’d most likely use it in. From simple standards to speedy sportbikes, here are 9 of the best entry-level bikes that are built to last and provide thousands of miles of adventure. Pro Tip: In order to tell which class a bike belongs in, you can look at the rider position. For example, on a standard bike your shoulders will be right over your hips, on a cruiser they will be laid-back behind your hips, and on a sportbike your shoulders will be leaned over your hips. Know how you like to ride? 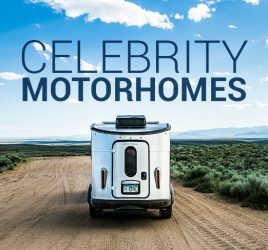 Check out some of your best options below. Standard or “naked” motorcycles have comfortable, upright seating positions with mid-range handlebars and footpegs which allows for comfortable riding in various conditions. Standard bikes also have average engine sizes, affordable price tags, and they make great bikes for beginners because you can do a little of everything. If you’re thinking about getting a motorcycle and are between a cruiser and a sportbike, the standard motorcycle is all you. 390 Duke. (n.d.). In KTM (Author). Sat at the tail end of the Central Eastern Alps, the beautiful Austrian landscape lays the perfect foundation for developing some of the finest motorcycles known to man, and the KTM 390 Duke does not disappoint. At 373 cc’s this single cylinder thumper delivers 43hp and 27 lb-ft of smooth low end torque–enough power to cruise the interstates on your next adventure or hoon around your local twisties. Coming in just shy of $5,000, this 328 lb (dry weight) machine fights above its weight-class. With a full 3.5 gallons in the tank and an estimate 58 mpg (fuelly figures), you’ll never be the first one in the group to stop for fuel. Last but not least, the upright riding position and 31in seat height provide a natural stance for decreased fatigue, however, you may want to invest in an aftermarket windscreen for ultimate comfort. 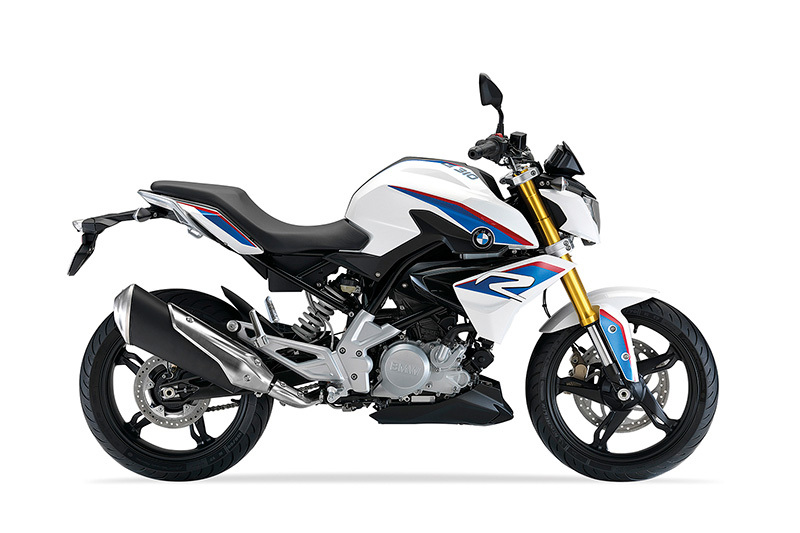 New to the scene for 2018: the BMW G310R is Bavaria’s first plunge into the entry-level motorcycle scene, and starting at $4,750, I think they’ve nailed it. Boasting a 313cc liquid cooled single, rated for 34 hp and 21 lb-ft, you’ll be surprised at how fast this peppy thumper gets moving. Coming standard with BMW Motorrad ABS, 6 speed gearbox, adjustable preload, and LED rear lights, this entry-level feels more akin to the luxurious full size beasts that BMW has been known to produce. With a 2.9 gallon and well over 60mpg, you’ll save at the pump while sitting comfortably on a 31.5 inch seat and in an equally comfortable upright riding position. Unlike many of the bikes on this list, the BMW also comes with a 3 year/36,000 mile industry leading warranty, so focus on the open road and let BMW worry about your bike for you. Honda has been producing some of the most reliable, comfortable, and down right great motorcycles for generations. The Honda CB500F fills these historic shoes with ease. Starting at $6,099, over $1,000 more expensive than the other two standards on our list, this 471cc parallel twin delivers superior smoothness in a very comfortable upright riding position. With a 30.7in seat height, 414 lb curb weight, and 4.4 gallon tank, practicality has never been closer to home. This bike has been in production for years, so you can hit the want ads and find your way into the Honda family at a heavily discounted rate. When a new rider like yourself thinks of a motorcycle, the image in your head is likely a cruiser bike. Built for more relaxed rides (cruising) with more manageable power, new riders should be able to handle these bikes no problem. Cruisers typically have lower seats so you can plant your feet on the ground easily. They also have an upright riding position and forward foot pegs, which is why most rider training courses use lightweight cruisers as instructional bikes. Pro Tip: Big cruisers can be heavy, so watch out, and don’t get more than you can handle. This lightweight cruiser motorcycle is perfect for beginners. 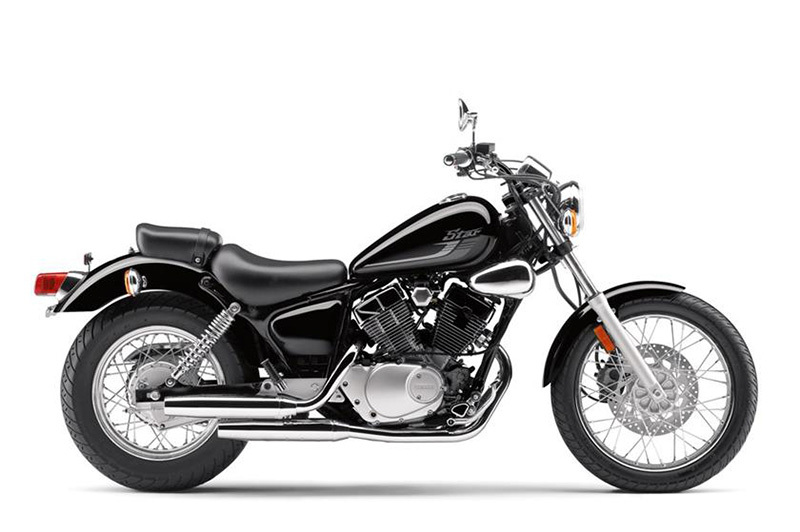 Manufactured by the Suzuki Motor Corporation, the Suzuki Boulevard S40 fills the gap between the less powerful 250cc entry-level cruisers and the more powerful twin-cylinder 500-650cc cruisers. Featuring a 652cc 4-stroke engine with a manual 5-speed transmission and a short seat height, making it a great option for shorter riders. This bike is blacked-out and all about style. 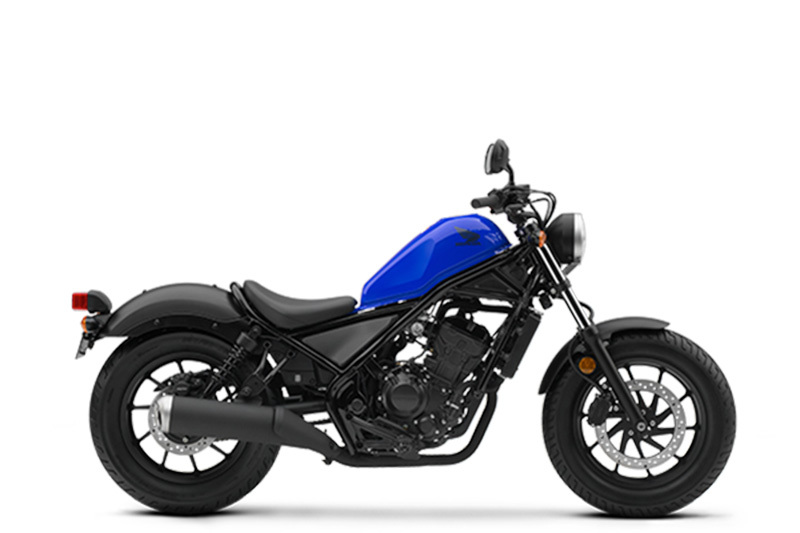 Manufactured by Honda, the Rebel 300 was built with a 286cc liquid-cooled single-cylinder four-stroke engine and a 6-speed transmission. It offers a midrange power that’s well suited for all levels of riders, especially beginners, and it can be customized. With a shorter wheelbase than most cruisers, at just 58.7 inches, you’ll have no issues maneuvering this ultralight 364 lb (wet) bike. A 2.96 gallon fuel tank and estimated 78 mpg will make even the most efficient of hybrids run for the hills. Starting at just $4,349, the Yamaha V-Star 250 leaves plenty of money on the table for all the gear your heart could desire. This entry-level cruiser has a 249 cc, air-cooled, 60-degree V-twin, 5 speed transmission, and a wet weight of just 326 lbs. With a 2.5 gallon tanks and 78 mpg, you’ll have more than enough range to explore. 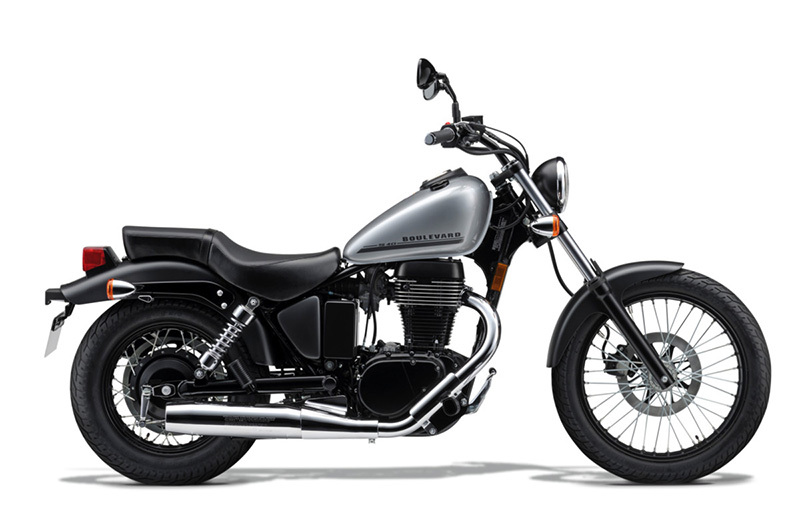 Styling on the V-Star is not hindered by the entry level price, and standard equipment includes dual exhausts, chrome trim, and a big brake setup up front. The V-star provides everything a beginner needs to enter the world of cruisers. Many people tend to think sportbikes are for seasoned riders, something you’d work your way up to. Lucky for you speed chasers and power enthusiasts, there are several sportbikes that are designed for less-experienced riders like yourself that are lightweight and easy to handle. That said, these bikes are built for speed, so it’s best to start with smaller engines. Pro Tip: Many sportbikes are high-powered. Make sure you choose carefully so you can ride well and most importantly, ride safe. This mall-capacity sportbike is not only sleek and practical, but akin to a surgeon’s scalpel, and it’s precision and rider feedback mirror that of a track ready race bike. With a 373cc single cylinder, more aggressive riding position, and premium WP suspension, the Austrian craftsmen have fit a lot of bike into what can frequently be found new for under $4,000 as a 2017 leftover. From the body work to the ergonomics, this bike will carry you through the turns faster than you’d expect and still push you to screaming top speeds in the straights. A 24-month factory warranty takes the pressure off and allows you to focus on hitting that apex. The narrow frame coupled with a 32 inch seat height means you’ll be able to get your feet down with confidence. Competition had always provided the building blocks to bigger and better things, and the Yamaha R3 has risen to the occasion in an entry-level class that has seen unbridled growth in the last few years. 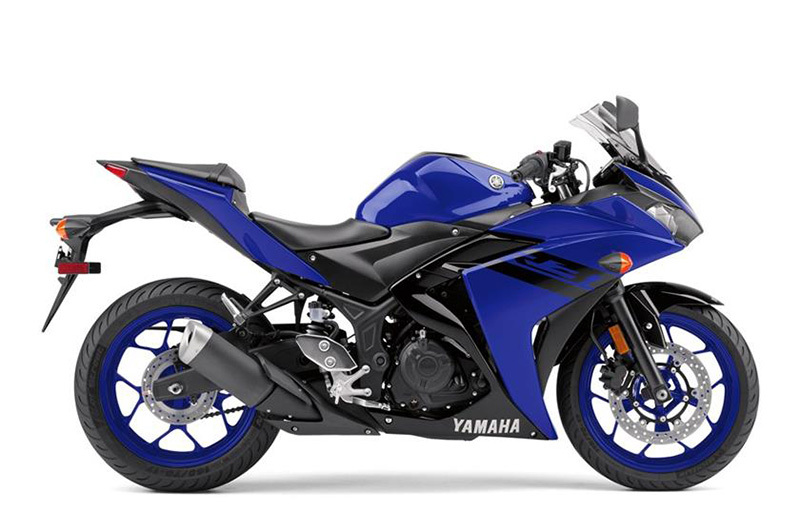 Manufactured by Yamaha since 2015, the Yamaha YZF-R3 is more commonly known as “R3”. Featuring a low seat height, a 321cc (19.6 cu in) liquid-cooled, 4-stroke, 8-valve, 180-degree crank inline-twin producing an extremely impressive 42 hp and 21 lb-ft of torque. A 30.7 inch seat sits lower than most bikes in this class, opening up the potential for riders of many heights to enjoy. ABS comes as an option from the factory at a price of $5,299. Sitting as a direct competitor to the Yamaha R3 and 300cc sportbikes alike, the Ninja 300 is a lightweight, inexpensive sportbike, perfect for new riders. Featuring a 296 cc (18.1 cu in) liquid-cooled, 4-stroke, 8-valve, parallel-twin engine, 6-speed transmission, and a top speed of 106-112 mph. The Kawasaki starts at $5,299 with ABS and combines big bike styling with lightweight and efficient entry level ergonomics. Weighing 383 lbs (wet), boasting a 4.5 gallon tank, and an estimated 60+ mpg rating, you can ride all day with ease. Kawasaki offers a 12-month limited warranty with Protection Plus extensions available. 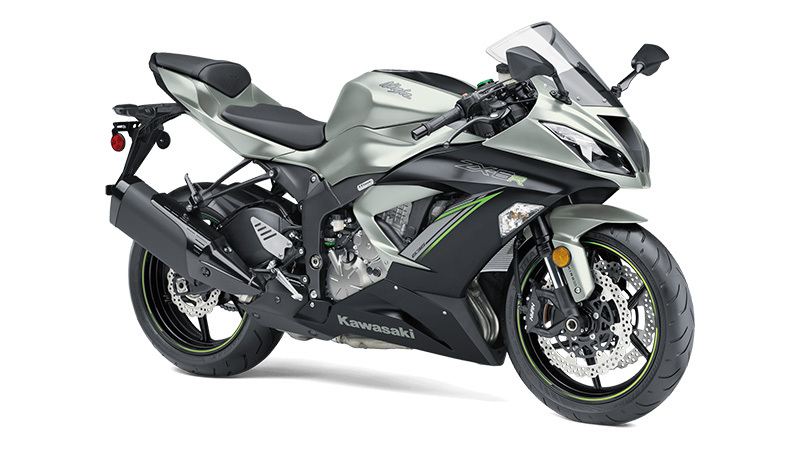 Kawasaki just released the Ninja 400 which has upgrades to its engine, frame, and other parts. Check out the Duke of DC’s full video review below, or read the full Ninja 400 review. When it comes to choosing a bike, remember to consider what you will be using it for, how much power you can handle, and what your budget is. As long as you stay on track, you should be able to find the perfect bike for you. Looking for other tips on how to buy your first motorcycle? Check out our 18 beginner motorcycle tips.